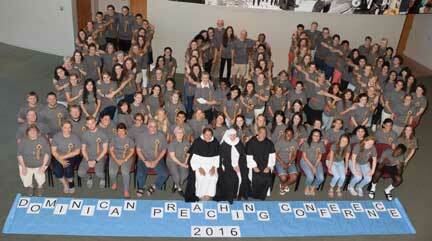 “The Dominican Story is only kept alive by live Dominicans,” words from Dominican scholar, Edward Schillebeeckx that can be heard echoing from Adrian, Michigan, the gathering site for the 18th Annual Dominican High Schools Preaching Conference. 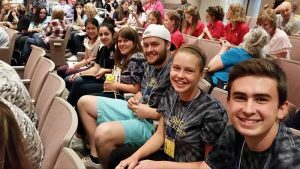 Students from 23 high schools, including two from Australia, gathered at Siena Heights University, June 24-29, 2016, to discover and deepen the preacher within. Using the 800th Jubilee Celebration of the Order for the theme, conference attendees met Saints Dominic, Catherine, Martin de Porres and Rosa de Lima, learned about the interfaith mission of the Order and connected with Dominican Family members that included the Associates, Laity, Volunteers and Young Adults in addition to sisters and friars. A rosary procession was prayed in five languages, German, Spanish, Vietnamese, Polish and Arabic with the Nuns of Mary the Queen monastery sharing the rosary they had received from the Nuns in Fatima. Participants arriving from Puerto Rico! Signs of the times presentations included Preaching Mercy, Respect for Elders, Awareness of Domestic Violence and Human Trafficking and an update of the United Nation’s Agenda 2030. Students participated in a service day that led to encounters with children, seniors, the economic poor and those regaining their homes as well as an opportunity to improve the local land through permaculture techniques. During the conference, Dominican sisters of Adrian prayed for specific school groups and the students met their prayer partners over ice cream before hitting the dance floor. The final full day of the conference was the opportunity use art to reflect upon the week and offer a visual preaching. And what is a Jubilee without cake? The final night of the conference concluded with a lovely banquet complete with a cake fit for an 800 hundred year celebration! A student commented, “The Dominican Tradition is something that should be celebrated. To survive 800 years in a society where most things can’t even last 10 days is worth appreciating!” The following morning at the commissioning liturgy, students shared how they will continue to live the Dominican charism within their school communities in the upcoming school year. Ready for the conference to begin! 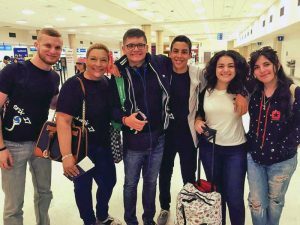 The Dominican High Schools Preaching Conference is a program of the newly formed Dominican Youth Movement USA, the umbrella organization that connects today’s youth and young adults to the Dominican tradition of preaching and the participant’s own call to preach. A big thank you to all the communities of sisters and friars who collaborated for another incredible week of sharing our charism with these young adults! Click for 2016 School Action Plans and a listing of 2016 Presenters.